I have some great news to share with you today! My husband and I have been fortunate enough to have found a house after the year long search and we actually closed on it yesterday! Our plan is to move in around October time once we have done some minor adjustments and painting etc. Although I am preparing to do alot of designing and decorating it's going to get done slowly overtime which means I can take my time to think it out and get each detail just right. I may just do a decorating series with progress pictures and inspiration but we will have to see. We are obviously very excited and I will definitely share more details about it very soon. The most exhilarating part for me is definitely having a kitchen of my own. I always remind myself that had I not been in my tiny apartment with it's small kitchen for 5 long years this blog may never have existed. It's where everything happens being that it's the center of the place and the one room with great natural light. From makeup work to blogging, cooking of course, photography, youtube videos and more. I am sad to say goodbye in some ways but I do look forward to the actual move and the changes it will bring in every way possible. I have been packing boxes slowly over the past few weeks as we waited to hear about the mortgage and I am elated that I can now talk about it! If you have been following me on pinterest you may have been a little overwhelmed with the amount of house design photos I have been pinning, but now you know why. If you have any tips at all in regards to decorating and design, please do share them with me as I can use them all right now! As I've been on the lookout for some kitchen inspiration I actually came across this one and don't you agree that it's quite striking?! 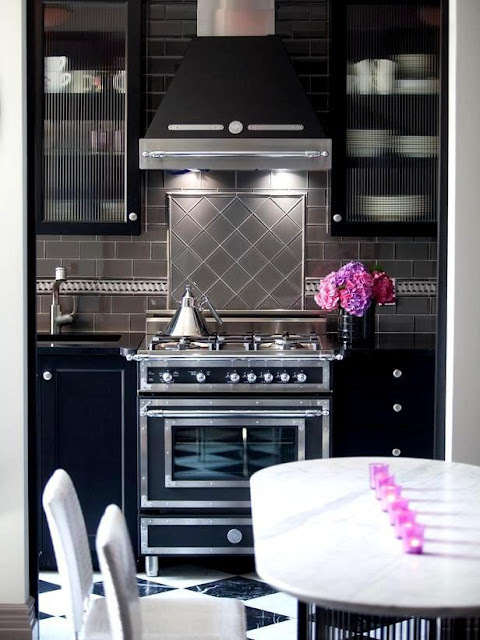 Black is surely not a color I've ever considered for a kitchen but it really suits this one well! 1) The almost see through cabinet doors above the stove. It gives nice contrast against that dark color with those white dishes peeking out a bit. 2) The pink details- the flowers in that vase on the counter and the candles down the center of the table. A pop of bright color is just what this kitchen needs. 3) The diamond accented back splash with it's light grey tones. The only thing I don't quite love is the flooring. I would have gone for less of that navy blue color and perhaps some grey, black or just plain white instead. What do you think of this months kitchen? Do you love dark colors in a kitchen or is it not your style at all? Let me know in the comments form! Do you have a kitchen to share? Send it to me by way of any of my social media and your kitchen could be featured here! Disclaimer: Some pictures in this blog post are from google or pinterest. If a photo is yours and you would like it removed then please contact me by email: gittyktz @ gmail dot com or in the comments form below and I will gladly comply immedietly.